If you’re looking for a really well-made, clean, thought-provoking, entertaining DVD, then look no further. ITV’s miniseries Downton Abbey has got all that and more – and it’s released on 8th November – in plenty of time for Christmas. 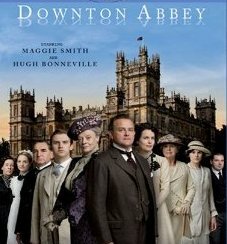 A costume drama with star-studded cast, and beautifully shot on location in Highclere Castle, Downton Abbey’s curtain rises on the arrival of a telegram informing the Crawley family and their staff of the sinking of the Titanic. It is 1912, and the world is changing. Moving seamlessly between above and below stairs, the series unfolds over the next two years, charting the hopes and dreams, the fears and failures, the joys and the sorrows of this miniature kingdom. Ii is an era of incredible social upheaval; one of the maids scandalises her superiors below stairs when they discover she has secretly been taking shorthand and typing lessons – why would she want to leave service to become a secretary? The chauffeur is a socialist, and one of the daughters of the house is an advocate of Women’s Suffrage. The family have always been accustomed to following their dreams, but the staff are only just beginning to see a world in which dreams might be worth entertaining. As duty ceases to be the only path available, and as social roles and responsibilities shift, how will the household adapt to their new-found opportunities? The characterisation is excellent, the story is well-crafted and contains elements which run through from the first to the last episode, as well as smaller dramas and conflicts which resolve within the hour. What I love most about it, though, is the positive portrayal of what are so often considered to be outdated moral standards. “I think I’ve let myself down”, Mary later confesses to the cook, and courageously chooses the difficult and humiliating option of confessing to the truth over looking good in the eyes of the man she adores. Time after time different characters, rich and poor, come face to face with their own weaknesses and are given the opportunity to choose the right or the wrong path. Unusually, and laudably, the good choices are consistently shown to be rewarded while the bad ones spiral out of control into a tangle of ever-worsening consequences. What a joy to discover that good quality, watchable, family-friendly programmes can still be made, and can honour Godly virtues without being either preachy or dull. 5/5 for this excellent addition to Sunday nights. If you’ve missed it, put it on your Christmas list today!